Dinner meetings are the 3rd Tuesday of every month. 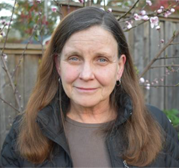 Christine Condon is an Analyst with the County of Sonoma Energy and Sustainability Division. Christine joined the ESD team in July 2017. She provides retrofit and new construction energy consultations for County, residential and commercial projects, manages the Division’s contractor workforce training programs and measurement tool lending library, and coordinates high performance construction trainings. Prior to joining ESD, Christine worked as a green building and energy project manager for ten years working on commercial, single family and multifamily residential projects for a private consulting firm in Santa Rosa. In addition to her work as a consultant in the private sector, she was a program engineer at the Pacific Energy Center where she managed the operations of and provided technical and educational program support for the Measurement Tool Lending Library for PG&E. OR sign up below to pay at the door with cash, check, or credit card. Members bringing a guest will need to sign up their guests separately. You may attend two dinner meetings without being a RERA member. Or register for this event by calling RERA at 707-545-2727; you will need to pay by cash or check prior to the day of the dinner.